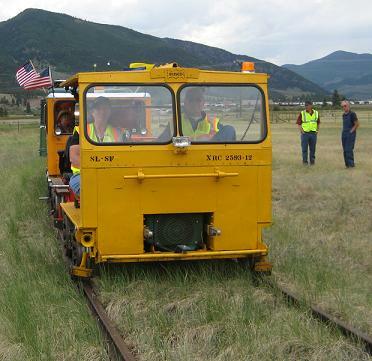 La Veta, Colorado to Fort Garland, Colorado with scheduled meet at Fir. Fort Garland, Colorado to La Veta, Colorado with scheduled meet at Fir. South Fork, Colorado to Creede, Colorado. Creede, Colorado to South Fork, Colorado. South Fork, Colorado to Wagon Wheel Gap, Colorado. Wagon Wheel Gap, Colorado to South Fork, Colorado. An overhaul of this Frisco Railway/Burlington Northern MT-14L motorcar began in February, 2008. This motorcar was used to build bridges on the Frisco (St. Louis - San Francisco Railway) and suffered severe roof damage along with subsequent reinforcement as a result of being slung by cranes. Roof damage caused by the bridge crews will not be repaired because it adds character to the motorcar. It maintains historical accuracy and is a common topic of discussion. NARCOA compliant spark arrestors were welded on to prevent trackside grass fires. Steel towbars and hitches were custom fabricated. New batteries and battery mounts were installed. Modifications were made to the electrical system. Many engine repairs were made as this car had not been on the tracks in about a decade. In May, 2008 the large 12" rotating beacon was lost in a hailstorm while traveling. A modern replacement LED beacon, powered by a cigar lighter receptacle, was installed. In June, 2008, it was converted from two seats to four seats with the addition of two captain's chairs. Custom fabricated seat brackets were welded.